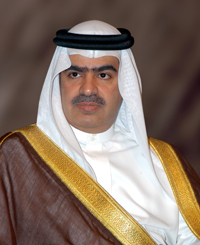 On the 24th of August 2015, His Majesty King Hamad bin Isa Al-Khalifa appointed Sheikh Fawaz bin Mohammed Al-Khalifa as Ambassador to the Court of St. James, accredited to the Republic of Ireland and the Kingdoms of the Netherlands, Norway, Spain and Sweden. Before becoming ambassador, HE Sh. Fawaz served in a number of roles, most recently as Minister of State for Communication from 2012 until 2014. He was President of the Information Affairs Authority between 2010 and 2012, having previously served as President of the General Organization for Youth and Sports between 2000 and 2010. Prior to his professional career, HE the Ambassador obtained a BA in Criminal Justice from the American University in Washington, DC and an MA in Public Administration from the University of Southern California in Los Angeles. He also received military training at the Royal Military College, Sandhurst. HE the Ambassador was awarded a number of honours for his services to Bahrain, including the Order of Sheikh Isa bin Salman Al-Khalifa, 1st class; the Order of Bahrain, 1st class; and the Order of Achievement, 1st class.